Affinity diagrams are a great method to help you make sense of all your information when you have a lot of mixed data, such as facts, ethnographic research, ideas from brainstorms, user opinions, user needs, insights, and design issues. Affinity diagrams or clustering exercises are all about bundling and grouping information, and this method can be one of the most valuable methods to employ. For this reason, it is used in many phases of Design Thinking, as well as outside of the design context. The Affinity Diagram is a method which can help you gather large amounts of data and organise them into groups or themes based on their relationships. The affinity process is great for grouping data gathered during research or ideas generated during Brainstorms. The method is also called “Space Saturate and Group”. The term “saturate” relates to the method in which everyone covers or saturates the “space” with images and notes, in order to create a wall of information, to inform, and start “grouping” the following problem-defining process. You then draw connections between these individual elements to join the dots and develop new and deeper insights. They will help define the problem(s) and develop potential ideas for solutions. In other words, you go from analysis to synthesis. Seeing the data coming to life and moving data on post-its around on the wall helps the design team to immerse themselves in not only their own findings from field work and research, but sharing and communicating the findings with other team members in order to get a broader scope of the problem space being investigated. Put pieces of data, small documented facts, drawings, ideas, and observations onto post-it notes, cards, or pieces of paper and put them up on wall charts, white boards or chalk boards. This is where the associated imagery of walls filled with post-it notes comes from. The sticky notes allow the design team to easily stick up and move pieces of data around in order to create clusters of similar themes, groups and patterns. Take one post-it and make it the first post-it in the first group. Take the next post-it and ask, “Is this similar to the first one or is it different?”. Then, you will place it in the first group or into its own group. 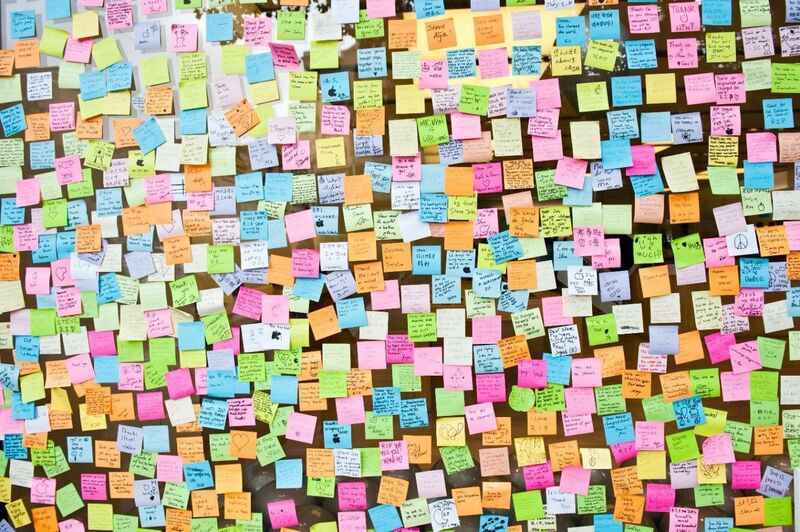 You continue post-it by post-it as you place similar ideas together and create new groups when ideas do not fit into an existing cluster. You should now have 3-10 groups, so it’s time to talk about the best elements of those clusters. Name the clusters to help you create an information structure and discover themes. Rank the most important clusters over less important clusters. Be aware which values, motives, and priorities you use as foundation ideas before you start ranking: Is this your user’s priorities, your company’s, the market’s, the stakeholder’s, or your own? Which ones should you put most emphasis on? Sometimes it make sense to create connections with other clusters using lines or other devices between individual bits of data or clusters of data. Describe what you have synthesised, for example, insights, user needs, pain points, or look for gaps you haven’t addressed yet. Focus on translating what you’ve organised and understood into practice, rather than just identifying similar ideas. Affinity Diagrams can help you go from complete chaos and no overview of your information to creating groups of information, which you have named and organised into hierarchies that make sense. Affinity Diagrams can help you bundle and cluster large bodies of information, facts, ethnographic research, ideas from brainstorms, user opinions, user needs, insights, design issues, etc. This method will help you name, rank and understand relations between groups of information. For this reason, this method is also known as “Space Saturate and Group” by d.school. This is a great method which can, if you follow the step-by-step process which we’ve described, surprisingly and straightforwardly create an overview and synthesise your findings. It’s important that you remember to sum up the major insights, user needs, pain points, gaps, etc. Once you’ve done that you can focus on translating what you’ve organised and understood and put it into practice.